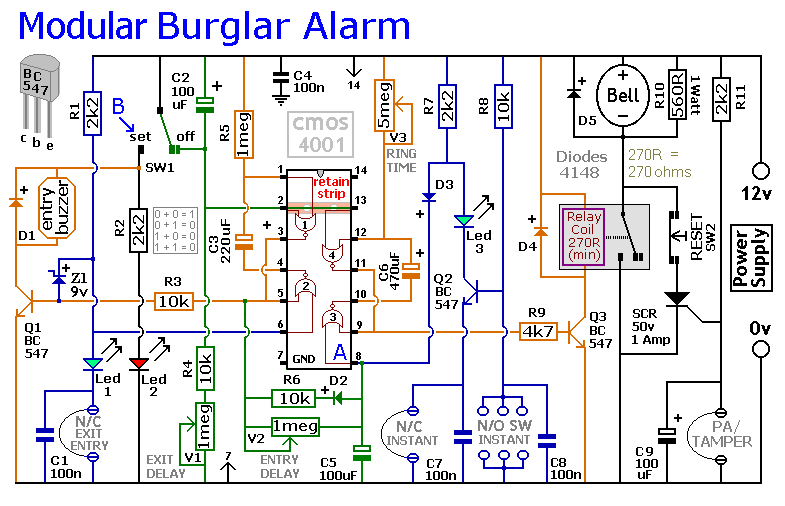 The Basic Alarm Circuit has an automatic Exit/Entry Zone - an Instant Alarm Zone that will accept both normally-closed and normally-open triggering devices - and an "Always On" 24-hour Personal Attack/Tamper Zone. By using the Expansion Modules - you can add as many extra alarm zones as you require. The Alarm is armed and disarmed by SW1. Before you move the switch to the "set" position - all the green LEDs should be lighting. You then have up to about a minute to leave the building. As you do so - the Buzzer will sound. It should stop sounding when you close the door behind you. This indicates that the Exit/Entry loop has been successfully restored within the time allowed. When you re-enter the building - you have up to about a minute to move SW1 to the "off" position. If SW1 is not switched off in time - the relay will energize - and the main bell will ring. It will continue ringing for up to about 40 minutes. But it can be turned off at any time by SW1. The "Instant" zone has no Entry Delay. The moment one of its normally-open switches is closed - the main bell will ring. Similarly - the moment one of its normally-closed switches is opened - the main bell will ring. If you don't want to use normally-open switches - leave out R8, C8 and Q2 - and fit a link between Led 3 and C7. 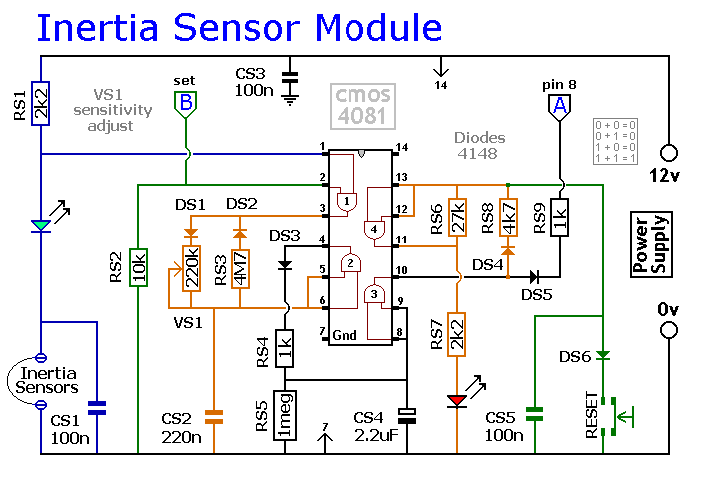 The 24 Hour Personal Attack and Tamper protection is provided by the SCR/Thyristor. If one of the switches in the normally-closed loop is opened - current through R11 will trigger the SCR - and the main bell will ring. In this case the bell has no time limit. To reset the PA/Tamper zone - first restore the normally-closed loop - then press SW2 momentarily. This will interrupt the current and reset the SCR. 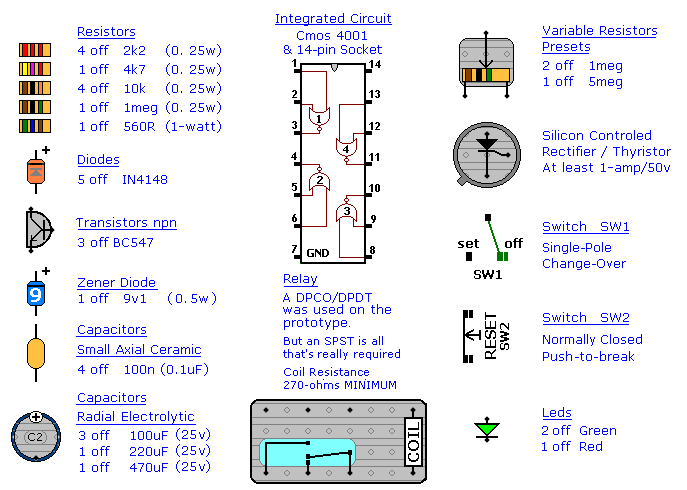 The basic circuit will be satisfactory in many situations. However, if you have a large building to protect - it's much easier to find a fault - when the system is divided into zones - and the control panel can "remember" which zone has caused the activation. The expansion modules are designed to do this. Although they will work with the existing instant zone - they are intended to replace it. When a zone is triggered - its red LED will light and remain lit - to indicate that the zone has been activated. 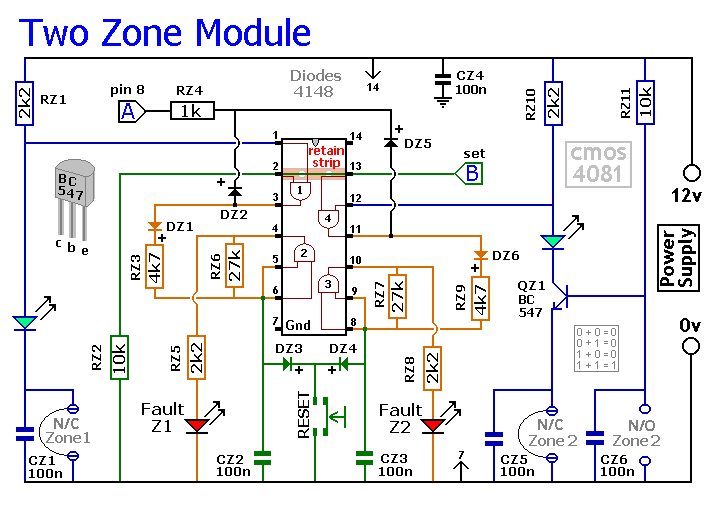 The idea is that - once you've noted the zone in question - you then press the reset button and turn off the LED. The reset button simply turns off the LED. It doesn't reset the zone. The zone resets automatically when the trigger circuit is restored. If you're using more than one expansion module - they can all share a single reset button.